Well, long time, no write. We’re already 5 (6?!) weeks into school and onto our second unit. New students are coming in every day, though a bit slower than before. We are actually winding down our second unit, which compares linear and exponential functions. We ask students to think about multiple representations of linear and exponential functions and compare and contrast them. There’s a lot we didn’t do (more complicated tables, anything non-negative, etc), but it feels a lot more solid than it did the last time we taught it. Our unit project involves kiddos researching the population of their home countries, then writing an equation to predict the population of their country in the future. Desmos is a popular graphing website. Super simple, low key. In a blog that I will write someday, I will talk about how complicated technology is for English Language Learners, especially kiddos who have interrupted education. 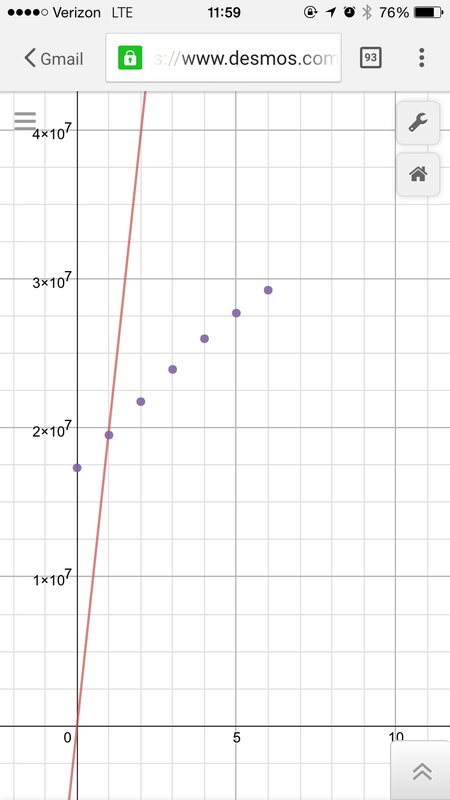 We decided this year that we wanted to use Desmos to have our kiddos check the equation for the population of their country after graphing by hand. We didn’t give them any practice and we gave them minimal structure. There was some struggle and…a lot (a lot) of teacher check-ins, but quite a few students produced a graph of their equation to compare to data points they had researched. The above featured graph is from two kiddos. Different countries, different languages. They still managed to work together to produce this graph (either of Peru or China’s population; I have to look at their final report, due Tuesday), to see whose country it is. The equation, for many reasons, doesn’t quite fit the data, but it’s a start.